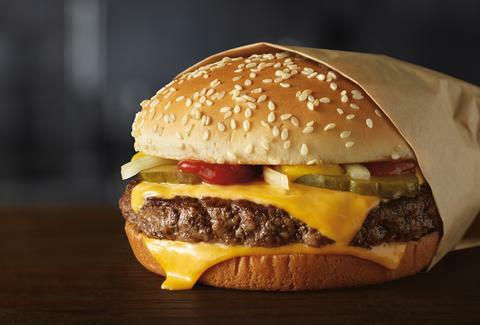 At this point in your life, you know exactly what you're getting when you bite into a Quarter Pounder from McDonald's. Your expectations for the greasy stack of meat and cheese were set many a late night drive-thru run ago. But it looks like that could all change -- possibly for the better -- thanks to a major update the company is making to the cheeseburger. On Thursday, McDonald's announced on Thursday that it's replacing the usual frozen beef patties it uses in Quarter Pounder sandwiches with fresh, never frozen beef patties that are cooked right when you place your order. The new beef patties will be available in Quarter Pounders at most of its restaurants in the United States by sometime next year. Big Macs and other burgers, however, will still be made with frozen beef patties. In addition to being fresh instead of frozen, McDonald's points out that the new burger patties -- like the company's current burger patties -- are 100% beef and are free of preservatives, fillers, or other additives. The hamburger purveyor said the shift is a response to its customers' "changing expectations," when it comes to ingredients in food and how it's served. Over the last few years, the company has started to clean up its menu by switching to antibiotic-free chicken, removing artificial preservatives from McNuggets and other menu items, getting rid of high fructose corn syrup in its buns, and committing to sourcing only cage-free eggs by 2025. "Serving All-Day Breakfast, moving to cage-free eggs and testing delivery are all proof of our commitment to building a better McDonald's," CEO Steve Easterbrook said in a statement. "And we are committed to transforming more aspects of our business, including offering a more modern and enjoyable dining experience, adding new levels of convenience and technology, and making more positive changes to the food we serve." News of McDonald's move to fresh beef comes just two days after Chipotle announced it had removed the last remaining artificial ingredients from its menu with the launch of new tortillas -- as part of its own campaign to regain its place in your lunch plans. Tony Merevick is Cities News Editor at Thrillist and rarely eats at McDonald's, but when he does, he gets a Double Quarter Pounder with cheese. Send news tips to news@thrillist.com and follow him on Twitter @tonymerevick.